You’ve got a big, blank expanse of plastered wall and a picture frame that would look perfect there. But everyone knows what a hassle it is to hang art, so that poor wall might stay empty. Fortunately, hanging picture frames is easier than it looks. Start by answering these basic questions. What’s your creative strategy? Are you simply trying to find a place for a solo picture frame? Or do you have several decorative or thematic pieces you’d like to work into a grouping? If hanging a single picture frame, its center should be positioned about 57 inches off the ground, on eye level with many. But if you’ve got a grouping in mind, get creative with formation. Use butcher paper or newspaper pages cut to the dimensions of your art and lay them on the floor or tape them to the wall until you like what you see. How heavy is your artwork? Generally, you can get by with a nail or picture hanger if your art only weighs a few pounds. If it weights over 20 lbs, you’ll need a threaded anchor for extra wall grip. What fasteners are you using. Most picture frames will come with a wire hanger attached horizontally to the back. Use picture hangers or a lone nail with this approach. Other frames might have saw tooth hangers for use with nails. How are your math skills? Have a tape measure handy for finding the horizontal center point on your artwork to catch the nail or picture hanger in the right place. Or cheat with a tube of gel toothpaste. Dab a little on the back of your artwork where the wire will be extended or where you saw tooth hangers are affixed. Then press your picture frame against the wall and the smudges will indicate nail positions. Keep in mind, it can be a perfectly legit design solution to prop your art against a wall or on a shelf and leave your wall unmarked. 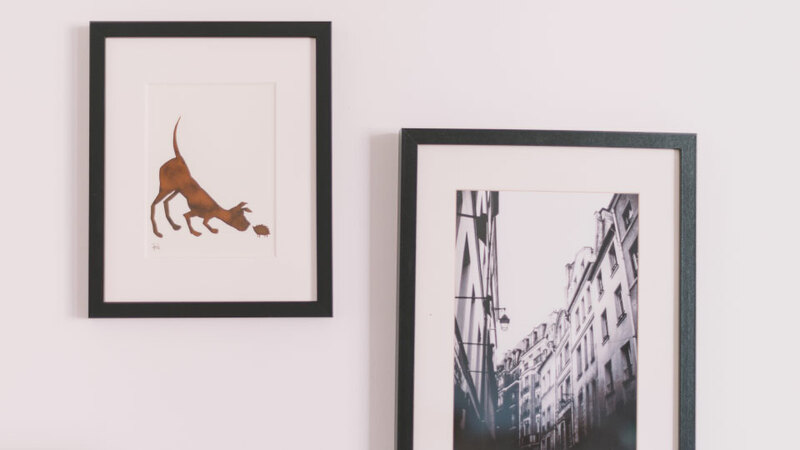 Find the frame that will accent your blank wall perfectly here at Frame Warehouse.